The MHDT Paradisea is an excellent sounding example of a NOS (non over-sampling) tube DAC. 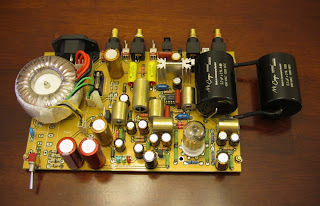 If you're not already familiar with MHDT's offerings or the concept of a NOS DAC, I encourage you to read through my post regarding the modification of the MHDT Constantine DAC. Both of the units make use of a Philips TDA 1545A DAC chip and come in a handsome translucent dark acrylic. 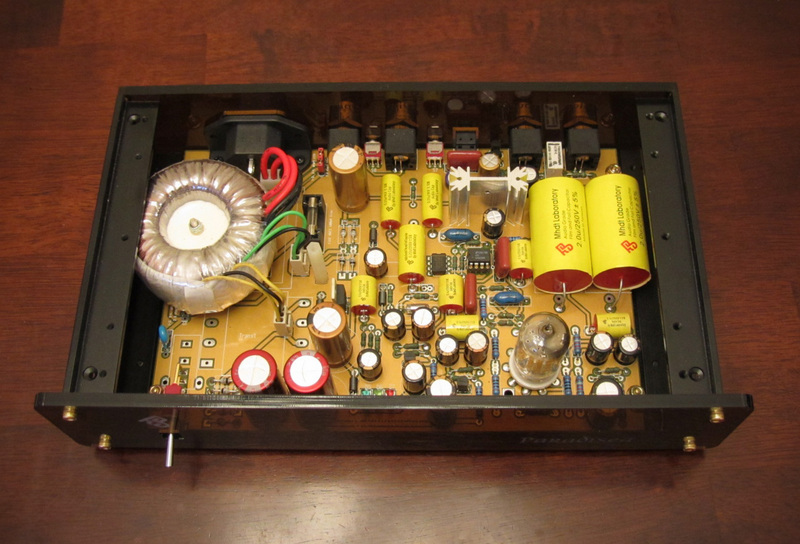 The main difference between the two units is the 5670 tube buffer, which is directly coupled to the op-amp. 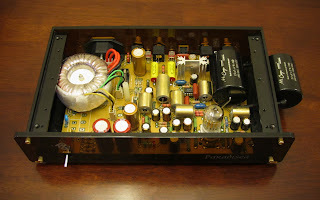 Per the Enjoy the Music review of the Paradisea, various tube equivalents can be substituted, such as the 2C51, Western Electric 396A, 6N3Pi (6H3pi), or the 6CC42. I have yet to experiment much with tube rolling on the unit, but the example here came with a Western Electric 396A. Visibly, there are quite a few more parts in the Paradisea, and MHDT appears to have used mostly Nichicon MUSE electrolytics versus the Elna Silmics in the Constantine. The Paradisea also contains a torroid rather than a flat-pack transformer, it appears that MHDT has switched their entire line to torroids now, so I'd imagine this difference is indicative of the vintage of the unit. Of course the unit was going to be going under the knife, but I wanted to identify my purpose for doing so. When I first plugged in the Paradisea, I immediately noticed a more crisp and detailed presentation as compared to the Constantine. While the added detail is nice, the treble energy may be just a tad much for those of us with sensitive ears. Taking a look at the parts inside, every resistor was blue, which in nearly all cases means that they are metal film. Carbon film resistors typically are a tan color, of course when it comes to boutique resistors, vendors color them whatever they like (pink Takmans, green Kiwames, red PRPs, etc.). The reason this makes a difference is that carbon films generally have a slightly warmer and more natural sound compared to the more detailed sound of metal film. The vast majority of new equipment makes use of metal film as it's very easy and cheap to get values within 1%. Carbon film is more typically found in vintage equipment, along with the slightly sweeter sounding carbon comp resistors. People tend to stray away from carbon composition these days (except for grid stoppers) as they pick up a little more noise and can drift over time, but they do have a nice sound and can be used as long as you are mindful of their shortcomings. Because I'm more fond of the sound characteristics of carbon film versus metal film, I decided that I wanted to replace as many metal film resistors as I could from the Paradisea. The MHDT units come with some very nice parts for sure, but there can always be room for minor improvements. I opted to replace the stock film caps, which are relatively small compared to other caps of the same value. Based on dimensions, Auricaps, Obbligatos or ClarityCaps would be the closest match, all being a little bit larger. I selected Obbligatos as they tend to be fairly neutral and are a nice price for what you get. The problem with Obbligatos is their attractive gold shell is conductive, so when the leads are bent around the bottom or the cap is sitting on solder eyelets, the shell will short them. I usually put some 3:1 clear heatshrink over top to prevent this from happening. For the output caps, which is a very audible position for capacitors, I selected a matched pair of 2.2uF Mundorf Silver in Oil. These are quite large, with thick leads, so some creative mounting was required. The solder eyelets for the capacitor leads had to be enlarged with a 1/16 drill bit, and one of the caps actually sits outside of the unit for a very hot rodded look :) When solder eyelets are drilled, it effectively separates the conductivity from the top and the bottom of the board, so in some circumstances, depending on whether the copper traces on the PCB run along the top or the bottom, you have to solder not only to the bottom but the top of the board as well. 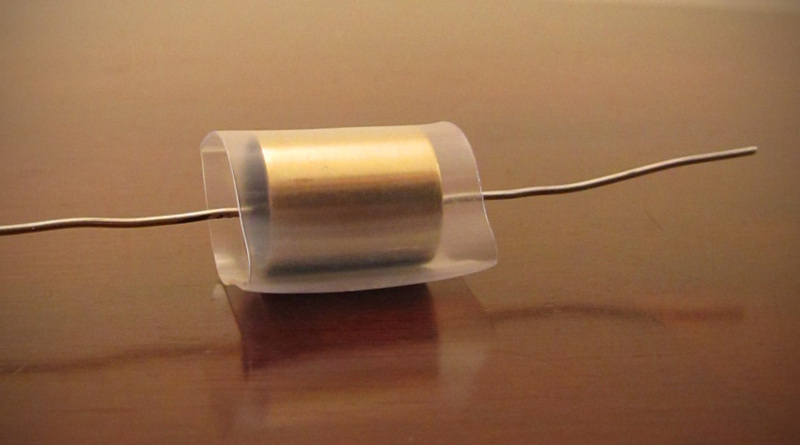 I opted to cover the leads of the right channel Mundorf capacitor with teflon, then sleeve them with black nylon as they would be visible from outside of the unit and needed to look nice. 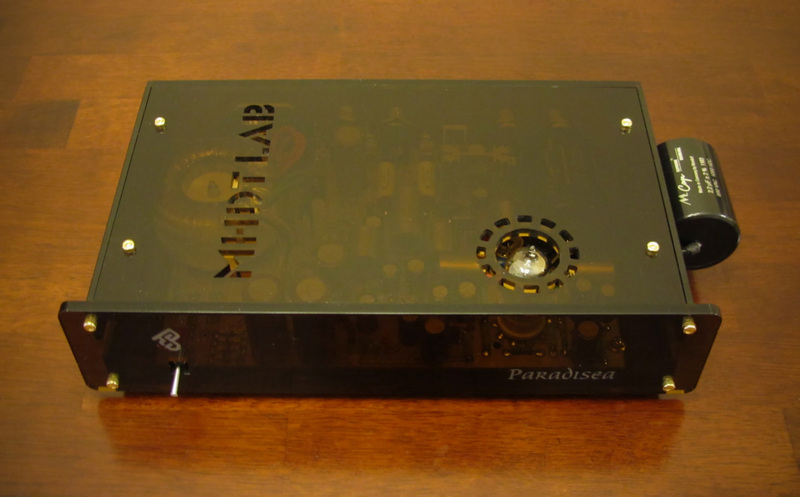 UPDATE (6/11/11): The Paradisea is made for op-amp rolling (pulling out the stock operational amplifier and putting a similarly spec'd one into the gold 8 pin socket). 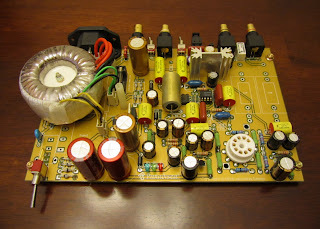 I dropped in a vintage NOS Tung Sol 2C51 tube and a Texas Instruments OPA2107AP op-amp in the unit. Immediately noticeable was a big bump in upper-end clarity and detail. I'll need to spend some time with the unit to see if this is preferable to the stock op-amp with Western Electric 396A or not (verify if this new-found detail is fatiguing at all over long periods). I had an Anedio D2 that I had to sell - well I'll buy another soon, or a Yulong DA8. The Anedio is simply Wonderfull. Anyway, I want to ask you if you can send me a short list of the values of the parts you used to upgrade your Paradisea - please. I have no electronic skills but I am very handy with an iron - I recently made a very good LM3886 amp, with a massive psu, black gates and ldr's. I hope that this is not being boring for you. Interesting that you're working on an LM3886 amp, I am working on one myself, albeit cost consciously with a single toroid and Wima / Elna Silmic caps. I hope yours comes out well! I'm afraid the list of parts that I replaced is long gone. Everything was an exact replacement, I just wrote down the stock resistors and capacitors in the unit. The biggest difference was swapping the op-amp. I ended up going back to the stock one as the OPA2107AP was a little too forward for my tastes (in my system). 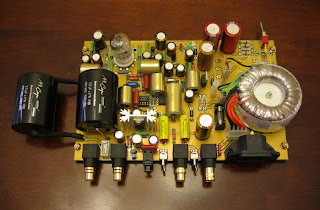 My amp is finished and it's really good. Better than Gaincard - I have one, so I can say it. This new one will stay, I mean the 3886. I can send you photos, if you want. LDR resistors make a big difference. I'm waiting for some parts to the Paradisea. I ordered a Spakos OPAMP, not a, IC, I think thid will make a huge difference. Thanks for the info Francis, I would definitely like to see photos of your 3886, I will shoot an email over to you. 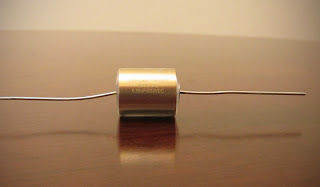 I was reading about the LDR resistor modules for the BrianGT LM3886 and they seem like they'd be worth a try.